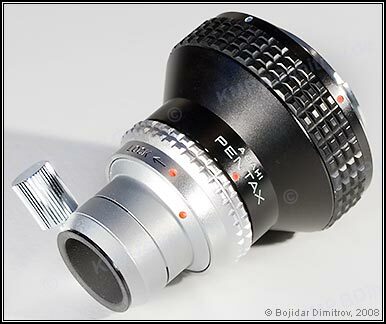 Two serious Pentax users have undertaken the tremendously demanding job of testing the resolving power of variuous Pentax lenses. This is a complicated task with an astonishing number of variables, and conduxting multiple test so that the results are meaningful requires choosing one fixed value for each variable and holding it constant over all tests. Our two testers work independently, and for some of the setup variables they have chosen different values from each-other. As a result, it is safe to compare the resolution tests by the same tester, but no conclusions can be drawn by comparing the resolution results produced by different testers. Still, the data is very valuable, and a summary of the resolution tests is presented here. The full details can be found on the Web pages of the individual testers. The 645 lens mount adapter permits the use of lenses designed for 645 cameras. The K-mount can be rotated 360° with respect to the larger mount. 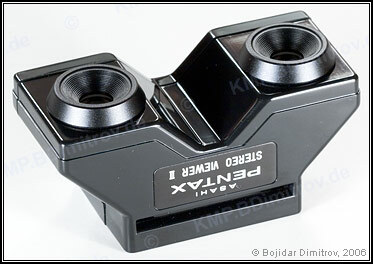 The 6×7 lens mount adapter permits the use of lenses designed for 6×7 cameras. The K-mount can be rotated 360° with respect to the larger mount. 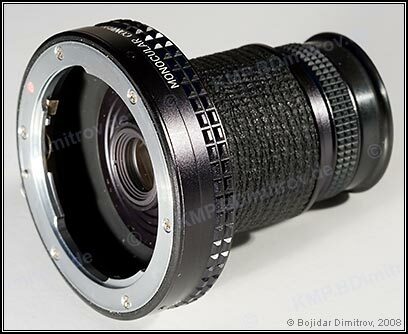 The 90° mirror adapter II allows 135 ~ 200 mm lenses to shoot at 90° to the lens axis. The microscope adapter can be used to mount the camera body directly to a microscope with 25 mm tube. The microscope lens adapter fits special-purpose objective or macro lenses to the K-mount. 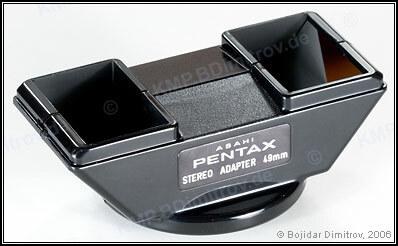 The reverse adapter permits mounting the lens with its front towards the camera body. Available in 49 mm and 52 mm sizes. Shooting through the stereo adapter (available in 49 mm and 52 mm sizes) produces stereo images that can be viewed with the stereo viewer II. 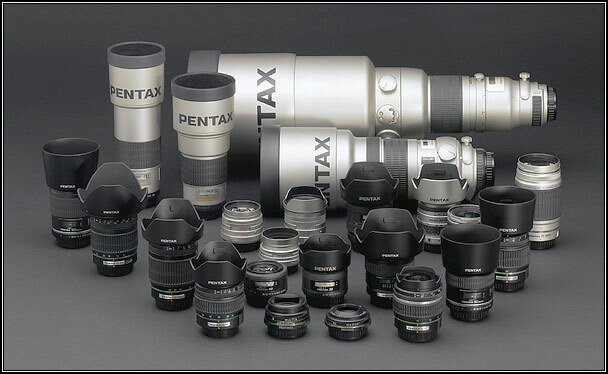 The telescope adapter allows Pentax telescopes 65, 85, and 100 to be used as super-telephoto lenses. The monocular converter K converts K mount lenses to monoculars. It provides magnification equal to that of a lens with five-times the focal length. For example, a 50mm lens appears to be 250mm and a 300mm lens appears to be 1500 mm. 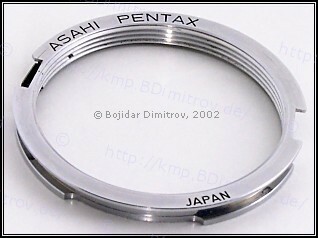 i = Pentax never produced a K-mount adapter (one that allows the use of K-mount lenses on screw-mount bodies) probably due to the fact that such a device would be of little use. Since the diameter of the K mount is larger than that of the screw mount, a K mount lens will have to be mounted in front of the screw-mount body, and the adapter will act like a short extension tube. Because of this, the focusing scale of the lens will not be correct, and the lens will not be able to focus to infinity.